A profile of Thomson Cruises’ new managing director Fraser Ellacott in last week’s Travel Weekly revealed that he is actually an airline man, and a technical one at that. After graduating from Glasgow University with a degree in aeronautical engineering, he worked for British Airways for fifteen years, holding engineering, operational and commercial roles. From British Airways, he moved to First Choice as their engineering director and was there when it merged with Thomson in 2007. Ellacott then became engineering director of a combined charter airline with 80 aircraft and 700 engineers (some may remember that Thomson’s in house airline was once called Britannia). When he became head of Thomson Cruises sixteen months ago he had never even set foot on a cruise ship (so at least he has not learned any bad habits). Among recent moves at Thomson Cruises has been the creation of a Platinum level, whereby first the Thomson Dream and then the Thomson Celebration will join Thomson Cruises’ more upmarket Platinum Collection, something that it has adopted from its shoreside resorts. The ships are being refitted and redecorated to bring them more upmarket. On the other hand, one ship, the Island Escape, which was taken over when Royal Caribbean withdrew from Island Cruises, continues as a buffet-style ship. This leaves Thomson Majesty, the line’s most recent acquisition from Louis Cruises, and Thomson Spirit, sister to the Thomson Celebration, as the odd men out. One thing Ellacott said in his interview was an echo of something we had heard in the past — probably before the market crash in 2009. 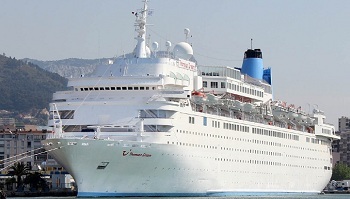 That is that Thomson has until now been surviving on second-hand tonnage, but when it comes to the next round there may not be suitable second-hand tonnage of the right size available as cruise ships have kept getting bigger — too big for Thomson. So newbuildings may have to be part of the consideration when it comes time for fleet replacement. This is not the first time this subject has been mentioned in the context of Thomson Cruises. The question then becomes, given that Thomson Cruises is part of the TUI empire, might we eventually see a smaller version of TUI Cruises’ STX Finland newbuildings coming to the UK? Coming from a technical and aviation background, Ellacott may have some different ideas here from the norm.